When I visited the library as a child, I always looked for stories about horses, books like The Black Stallion or Misty of Chincoteague. I signed them out many times and read them over and over. So I'm always thrilled when I find a new horse story to read. From the author of A Dog Called Homeless, winner of the Schneider Family Book Award, comes another gentle novel with a touch of magic about the power of friendship and the truth of belonging. Nell isn't happy about spending her vacation on a farm, but when she meets a half-wild and mysterious girl named Angel, the two girls are tied in an adventure that may help Nell discover something special about herself—and the most special of a hundred horses. Girls and horses are a classic pairing, and fans of favorites such as My Friend Flicka and Misty of Chincoteague are sure to love the heartwarming friendship story and adorable—magical—animals in A Hundred Horses. 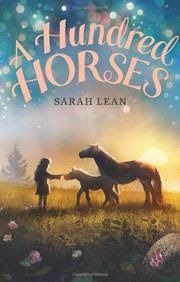 This was an interesting book about two very different girls developing a friendship and rescuing a horse and its foal. A touch of mystery kept me reading. It was interesting to me to see the farm setting through the eyes of Nell, who’d grown up in a city and was experiencing a different lifestyle. There were many layers to this story, such as Nell sorting out her relationships and feelings with her father and her mother. I also admired some of the descriptions like “I hear the shuffle of the quilt on the bottom bunk” because they are small details that are so in the moment of what is happening. Sarah Lean lives in Dorset, England with her family and dog. She used to teach school before obtaining a Master’s degree in Creative and Critical Writing from the University of Winchester. This book, A Hundred Horses is also published under the title A Horse for Angel (possibly the UK version). "...don't keep reworking the same piece for too long. Your writing can only grow if you give yourself new things to write---much like a plant can't grow bigger if you keep it in the same pot." This really hit home for me, because I have one novel that I keep revising and still can't get to work. I'm a terribly persistent person and hate to give up on something. But when I read the new project I'm working on, I can practically see what I've learned, because it feels so much more natural and alive. I often wonder if revisions can be overdone, drumming all the best parts from a piece of writing. I think they can. I’ve been busy writing my own novel, so I haven’t been visiting the library as often as I usually do. But every once and a while, I like to pull a favourite book from my own bookshelf. The City of Ember is definitely one of my favourites! 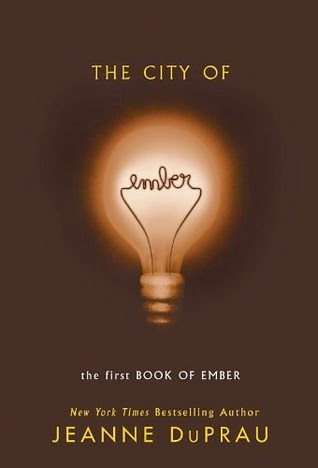 Lights shine in the city of Ember—but at the city limits the light ends, and darkness takes over. Out there in the Unknown Regions, the darkness goes on forever in all directions. Ember—so its people believe—is the only light in the dark world. And now the lights are going out. Is there a way to save the people of Ember? No one knows. But Lina Mayfleet has found a puzzling document, and Doon Harrow has made discoveries down in the Pipeworks. With these clues, they start their search. I enjoyed this book when I first read it a few years ago and I still enjoy reading it now, even though many great dystopian books have come along after it. One of the reasons why I like this book is because I connected with the idea that resources have their limits and the “what ifs” that follow. It’s so interesting to think about the different perspective people might have if they grew up in an underground world. I also liked the characters – Lina, who likes to see new places and draw, and Doon, who is interested in insects and figuring things out. To me, this is a great example of book that is very definitely middle grade, with middle grade dialogue and concerns. As a writer, I especially enjoyed thinking about the details the author used to bring out the setting and this very different world. Jeanne DuPrau is a writer living in California. She has a dog named Jockey and enjoys gardening and reading. The City of Ember is American Library Association Notable Book. There is a movie of this book, which to me had a very different tone and feel from the book, as well as different events, so I found it disappointing. But it would be interesting to read the book and then watch the movie to compare them and think about the differences and the effective elements in each. For more, visit Jeanne DuPrau’s website. Middle grade author Alexandra Amor recently started the Writing for Kids Podcast to "inspire, encourage and inform" children's writers. This podcast follows a conversation format and covers topics such as creativity, writing practices, self-publishing, and book marketing. I listened to Episode #5: Writing a Series with Becky Citra. Along with some insights from Becky about writing a series, I was interested in their discussion of the writing and drafting process. They also talked about the challenges of getting into a kid's perspective in the 21st Century, technological world. I've featured Becky Citra on my blog a couple of times for Marvelous Middle Grade Monday, so it was very interesting to hear her take on writing middle grade. 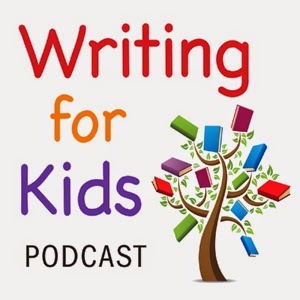 And I really enjoyed listening to a podcast that was specific to the age level I write for, even though the topics and issues are relevant to writers of other age categories too. I'll definitely listen to more of these. When I visited, they weren't listed on iTunes yet, but Alexandra's website says they will be soon. Until then, you can play them directly from the Writing for Kids Podcast site.